A giant hippo is currently floating in the Thames. It goggly eyes and cartoon curves are a pop-art facsimile of the real thing. Florentijn Hofman’s HippopoThames is totally unreal and rather improbable. But then the idea that a hippo would make its home outside the Houses of Parliament *is* improbable. Hippos *did* swim in the Thames. In the last warm-stage of the current Ice Age (we’re in a warm stage now), 125,000 years ago, the same species of hippopotamus that is now only found in Africa lived all over Europe. And that included the UK. Bones of hippos have been found across London, including Trafalgar Square. It lived alongside lions, straight-tusked elephants, hyaenas and rhinos. Yes, once upon a time there Trafalgar Square had actual, real-life lions. 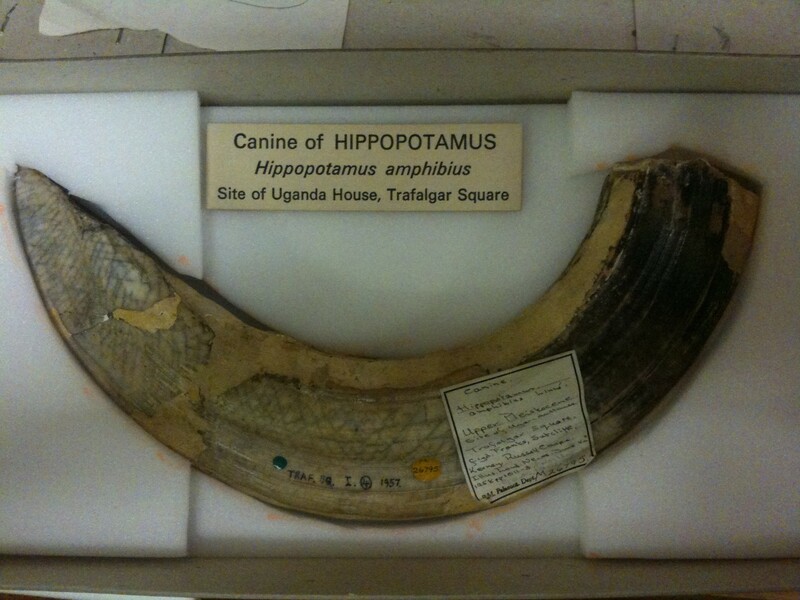 A Hippo tusk from Trafalgar Square, London. (c) Natural History Museum. I talked about this, and other aspects of prehistoric London, yesterday at a special HippopoThames-linked event at the Doodle Bar in Battersea as part of the Totally Thames Festival. The poet Tom Chivers and Guerrilla Geographer Dan Raven-Ellison spoke as well, and our aim was to explore the changing nature of the River Thames, its natural — and unnatural — history in the past, present and future. I covered the past. Tom brought us into historical time through poetry inspired by the lost tributaries of the Thames that flow beneath our feet, and the way that the ebb and flow of the Thames has shaped our modern city. His poems were introspective, thoughtful and quite beautiful. Then Dan launched us into the future with his call-to-action to help make his vision of London as the world’s first National Park City, with is rich urban biodiversity and culturally important landscapes. Together I hope we showed the ever-shifting nature of the River Thames, and challenged simplistic ideas of what ‘natural’ means. But also the Thames’ fundamental importance in making London what is today. And, if course, making HippopoThames that ever-so-slightly less improbable.